This training program takes participants on a unique learning journey which involves pre and post-training activities. The program focuses on one of the most critical hurdles organization’s face today, which is strategy implementation. It is estimated that approximately 70-90% of organizations fail to achieve their intended strategies often due to a number of factors which will be addressed in the course itself. 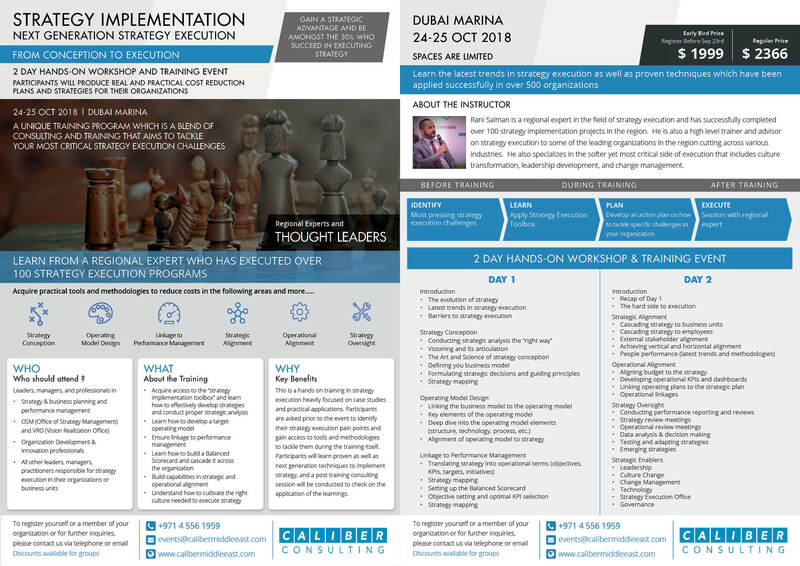 Delivered by some of the leading regional experts in the field, the 2-day program gives an unparalleled comprehensive toolbox for all six key dimensions of strategy execution. These dimensions include strategy conception, operating model design, linkage to performance management, strategic alignment, operational alignment, and strategy oversight. Other than being a very practical course centered around practical cases, exercises, and examples; this certified course aims to give next-generation techniques and trends on strategy implementation.